Let the bidding begin! With the Legacy of Hope gala less than a week away, NewBridge Services today opened its auction on more than 50 fabulous items, getaways and experiences. Have fun and bid often, knowing the prizes will bring great pleasure and the proceeds will help support NewBridge’s important work. Up for grabs are a 4-night stay at the Puntacana Resort & Club Caribbean Paradise, a three night Lake Tahoe ski getaway, and a three-night Sonoma Wine and Dine, all with airfare for two; a Royal Caribbean cruise; and an overnight stay with dinner for two at the Borgata Hotel Casino & Spa in Atlantic City. Gift certificates to top restaurants, including the Ninety Acres Culinary Center in Peapack, The Little Food Inn in Pompton Plains, and Novelli Restaurant in Wayne, are also available. Get in shape for summer by bidding on YMCA and sports club memberships or a personal training session. Enjoy a golf outing for four people, go see a Mets or Yankees baseball game, get a bicycle, or take a limousine ride to New York City. Memorialize your family with a high-end portrait, get legal and chiropractic services, or bring home a gift basket. Bid on designer jewelry and handbags, including a David Yurman Classic Bracelet and an Aquatalia Summer Tote. To start bidding, go to www.501auctions.com/newbridge2018 and click on “View All Items” in the left-hand column. We at NewBridge look forward to celebrating with you at The Legacy Castle in Pequannock Township on Thursday, April 19, starting at 6 p.m. In addition to the auction and wine raffle, the night’s festivities feature a cocktail hour and open bar, dinner, and dancing to a five-piece band. 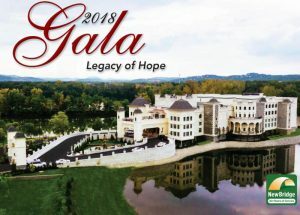 The Legacy of Hope Gala is our biggest fundraiser of the year, allowing NewBridge to help nearly 8,000 children, adults and seniors overcome challenges and live better. (You’ll hear from a few at the gala.) Through programs in counseling, housing and education, NewBridge has been helping to build stronger, healthier communities in northern New Jersey for 55 years! Tickets are $150 per person and parties of 10 can reserve a table. To register, bid on auction items, or become a sponsor, go to www.501auctions.com/newbridge2018. Contact NewBridge Director of Development Vicki Hess if you have questions at vhess@newbridge.org or (973) 939-2427. See you there!